This is how I found Mister A after leaving him for 5 minutes to do some colouring. 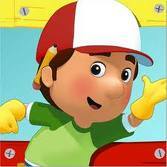 Apparently Handy Manny does it!! I'm speechless. Thanks Playhouse Disney!